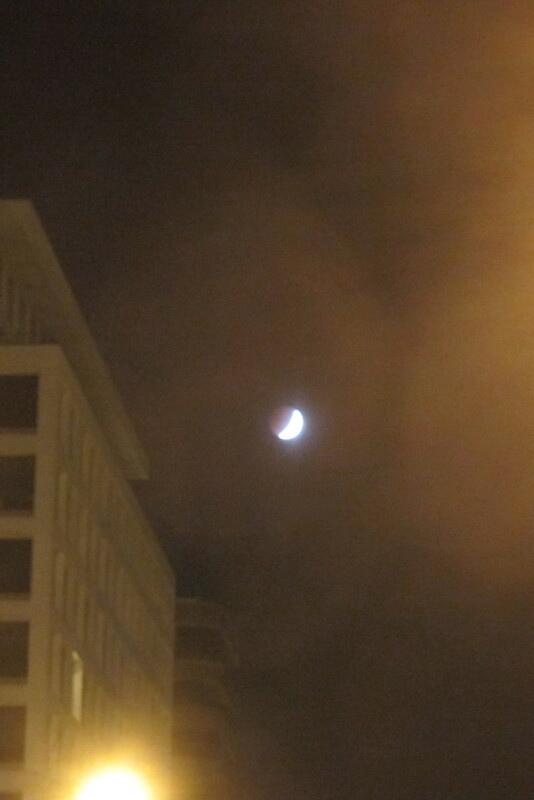 The locations were in the Downtown area of Washington DC. The "Take It!" If ever there was reason to attempt a set of photographs - this kind of act of nature provides it. The big question leading up to the early morning of the eclipse of the moon was if we would have cloud free skys enabling all who were up to witness this great show. We were rewarded with not only clear sky but temperature that was pleasant as well. The above shot shows the start of the shadow of our earth on the upper left side of the moon. The lower shot is at the conclusion of the eclipse and is spectacular in its own way. The After Take: Several of those who I showed these photos to had been up to see the event for themselves. The look on their faces was one of a mental replay of their excitement from their original experience. This mix of the mind of having the background of memory playing while engaging in the present is a marvel all of its own. For those who had not seen the marvel when it happened, there was another sort of magic on display as I handed them the camera with the monitor showing the captures. Even though we have had cameras for many years - I think we all still are in awe when we see an image that is being held for us to enjoy over and over again. The title for this set of shots was taken from the fact that the photos were taken as we moved through the city on a prescribed route with set stops along the way. Had I taken the day off - I would have gone to the National Mall and taken my photos from there, not only to include the famous buildings but to be able to label the series " The Eclipse from the Ellipse " which has its own bit of fun in how saying it, rolls off the tongue. Even though my camera is not one with a lot of horsepower, I am glad it was able to do the job up to the level it did in order to share this wonder with all of us. Here is the hope that many of you were able to witness this wonder wherever you were when it happened and the joy of this is still with you. I caught that. It was really cool to watch! I cannot be up at that hour to catch stuff like this, cool pictures! I think I caught the end of it. 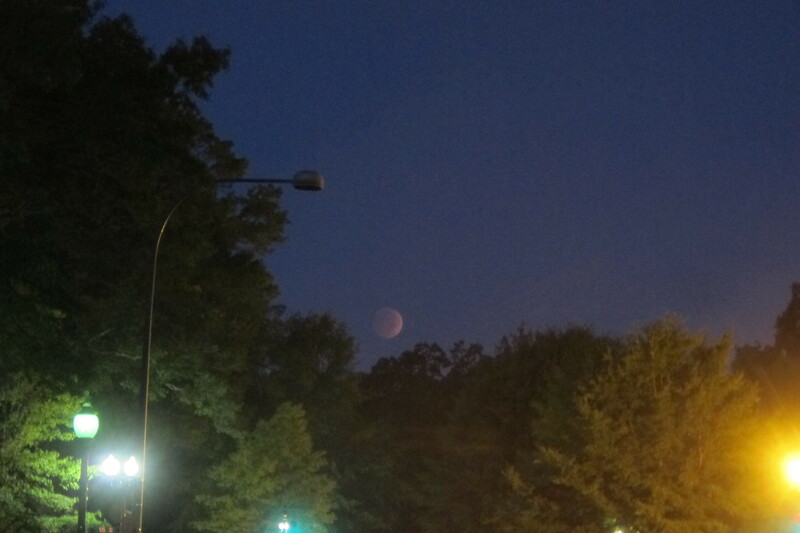 The moon had a brownish red tint to it. Was it a full eclipse? The science department at the school Teri and I teach at had a 2:30am viewing for students. I decided to sleep instead. NASAP always posts time lapse videos of stuff like this on YouTube. Its worth a look.